“Senate Park Commission releases the McMillan Plan for the National Mall,” Histories of the National Mall, accessed April 23, 2019, http://mallhistory.org/items/show/206. In 1902 the Senate Park Commission announced a plan to renovate the National Mall. Named after the committee chair, Senator James McMillan, the McMillan Plan redesigned the layout of the Mall from a system of informal gardens to today's streamlined, symmetrical, neoclassical landscape and architecture. This plan also supported the creation of monuments and museums along the expanse of the Mall, and the integration of East and West Potomac Parks into the National Mall. 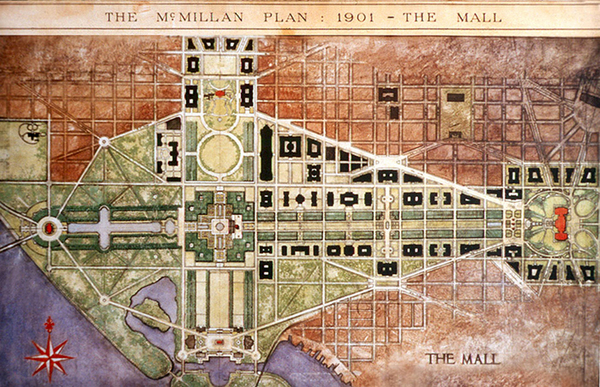 The McMillan Plan changed the Mall from a commercial area and city park into a monumental center for the nation. National Capital Planning Commission. View original.